This product has been scientifically prepared in beverage form. Serve chilled for full flavor and full strength using the enclosed straws, can also be diluted in hot or cold water if desired. Store in a cool place, some settling may occur but will not effect the quality or taste. Shake well before drinking. Ingredients: Water extract of best quality of angelica root. Red date in a honey base. Two bottles daily in the morning and before sleep. *This statement have not been evaluated by the Food and Drug Administration. This product is not intended to diagnose, treat, cure, or prevent any disease. Astragali Extractum is a dietary supplement and one of the most widely used in Chinese Herbs that grow in the North eastern province of China. Ingredients: Pure Astragalus extract in honey base. One bottle of 10ml each time to be taken twice daily in the morning and evening. The bottle should be kept in a cool place, but not refrigerated. Its is advisable to shake a bottle before taking when precipitation appears. Beijing Royal Jelly have been considered as ancient treasures. It's delicacy is still highly valued consumed by million worldwide. The Royal King brand product has been scientifically prepared with precious natural ingredients in beverage form for convenient consumption. Ingredients: Distilled water, honey and royal jelly. To enjoy this delicious herbal supplement with full strength, use the enclosed straws. The extract also can be mixed in hot or cold water, or tea. For best results drink two bottle daily, in the morning and before bed time. This preparation contain the main ingredients of Deer's Tail Extract and fresh Royal Jelly. Deer's Tail Extract has been considered very valuable by Chinese for many years. Fresh Royal Jelly is a milky glandular secretion of the worked bees for the sole provision of nutrition to the queen bee. The Ginkgo plants considered as ancient treasure that are still valued today. Gingko leaf has long been considered as herbal delicacies. Ginkgo leaf extract is made exclusively from the prized Gingko plant that is first produced in China. Each 10 ml vial contains 2000mg of Ginkgo Biloba leaf extract. For result drink one bottle in the morning and one in the evening. Ingredients: Extract of Ginkgo Biloba leaf in Honey base. Two vials daily, in the morning and before bed time. The Ginseng and Ginkgo plants considered as ancients treasure are still valued today. 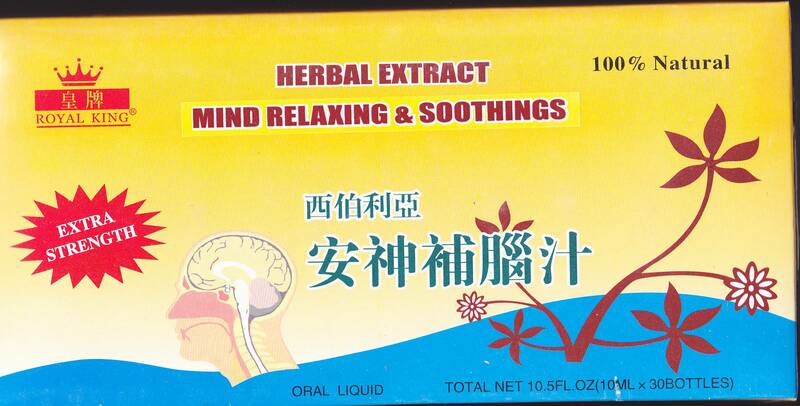 Gingko leaf extract along with the noted qualities of ginseng have been considered herbal delicacies. Ginkgo Leaf extract is made exclusively from the prized Gingko plant first produced in China. Each 10ml bottle contains 600mg of Ginkgo Biloba leaf extract. For best result drink one bottle in the morning and one bottle in the evening. Ingredients: Extract of Ginseng Roots and Ginkgo Biloba Leaf in Honey Base. Two bottle daily, in the morning and before bed time. Ginseng Royal Jelly has long been a source for nutrition throughout the World. Content: Each bottle containing 10ml an extract from 2000mg of red panax ginseng plus 400mg royal jelly. Ingredients: Water extract of Ginseng, Honey and Royal Jelly, Sorbic acid as a preservative. One bottle daily in the morning or before sleep. *This statement has not been evaluated by FDA. This product is not intended to diagnose, treat, cure or prevent and disease. CAUTION: Contains ingredients derived from shellfish-individuals allergic to shellfish should not use. Take one or two bottle before breakfast to get the full benefits all day. To enjoy this delicious herbal supplement chill and drink full strength using the enclosed straws. The extract can also be mixed in hot or cold water or tea. This produce has been developed from traditional Chinese formulas combined with modern scientific techniques using by the most selected premier Siberian Ginseng Roots. Ingredients: Water, Extract of Siberian Ginseng Root in honey base. Alcohol Free. This product has been scientifically prepared in extract form. Serve chilled for full flavor and full strength using the enclosed straws, can also be diluted in hot or cold water if desired. Ginseng, the root of Araliaceae, is a precious natural product growth in the Mt. Changbai region of Northern China. This exquisite root has been blended with natural flavors to give a unique taste. Ingredients: Distilled water, red ginseng extract, alcohol, honey and licorice. Content: Each 10ml (0.34 fl.oz) bottle contains a standardized extract of 38 mg active ginsenosides from 8000 mg. premium quality Red Panax & Shih Chu Ginseng Roots. Panax Red Ginseng the root of Araliacease, is a precious natural herb grown at Mt. Chang Bai of China. Ingredients: Distilled water, an extract of Red Panax Ginseng in honey base. Content: Each 10ml (0.35 fl.0z) bottle contains standardized extract of 25 mg active ginsenosides from 6000mg, premium quality Red Panax kirin & Shihu Chu Ginseng Roots. Take one or two bottle before breakfast to get the full benefits all day. For full flavor and to taste the potent strength drink using the enclosed straws. Extract can also be diluted in hot or cold water for a refreshing and natural herbal beverage.